Lewis is an alumnus of the prestigious Bedford Modern School, which traces its roots back to 1566. He has developed a keen interest in buildings and property, originating from his studies of the philosophies of Architecture. Lewis graduated with a BA in Philosophy from the University of Reading. 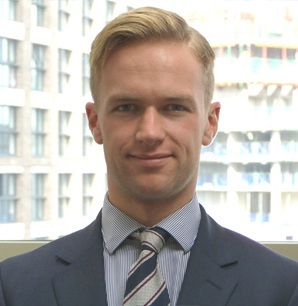 Since graduating from law school, Lewis has experience of working in the City of London, in commercial real estate and property litigation. Taking this experience into Adams Kaye, Lewis assists clients throughout the entire sale and purchase process. Staying true to the Adams Kaye ethos, Lewis offers a professional yet affable service to clients, ensuring a high quality of service throughout. In his spare time, Lewis is an avid rower, having rowed for both his school and university, before turning to coaching during law school. Lewis is also a passionate musician, playing drums and guitar, and has played with numerous bands and artists. Adding another creative string to Lewis’ bow, you can actually find Lewis playing small cameos in ‘Fantastic Beasts and Where to Find Them’ and the Netflix series ‘The Crown’.